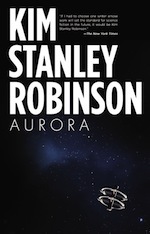 The Science In The Capital trilogy consists of three novels by Kim Stanley Robinson that explore the interaction of science and politics in the United States capital, Washington, D.C.. They were also marketed as the Capital Code trilogy and have also been called the 40/50/60 novels. An omnibus edition, but with compressed and amended text, came out under the title Green Earth. Because of their basis in realistic situations, their depiction of topical themes and their setting in a time quasi-concurrent with the present at the time of their writing, they are notable for the sense of urgency that transpires from them. Serious weight is given to the need to tackle climate change on both national policy and international relations levels. They were written during the presidency of George W. Bush, whose ideology and policy-making was opposed to taking any action that was significant enough on these matters. Modern urban lifestyle and "repaleolithization"
The trilogy shares some characters with the novel Antarctica, more specifically US Senator Phil Chase and his envoyé to Antarctica Wade Norton. The main setting for the trilogy is, of course, the nation's capital, Washington. There are frequent visits to California, a hub for biotechnologies research, and occasional visits to other places around the world (the island nation of Khembalung, the Atlantic ocean, China). Purchased a copy of Green Earth ca. October 2016. This copy is missing pp 401-432. Wonder if this has been reported by others and if I can get these pages as PDF or similar.